It was one of those busy days where cooking was the last thing I wanted to do, but an unexpected guest sent me into panic mode. So off I went with the guest in tow to find a place to lunch without a reservation. Best place to try our luck was the piazza in Castle towers, for there are many restaurants to choose from, and I knew at least one would be able to accommodate us. My options narrowed down as fast food types were not even under consideration, as I wanted to impress my guest. Since the two of us had our minds set on Asian food for lunch, we collectively decided to try Taste of Malaya; the only restaurant at the piazza that I had yet to try. 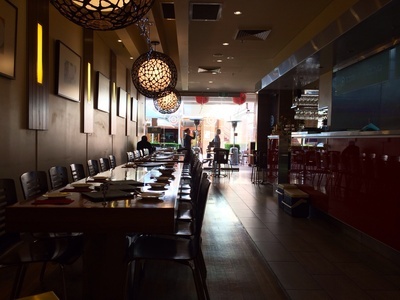 Though the restaurant was somewhat busy, the staff was able find us a spot...actually a quiet corner for us to lunch in peace. The service was prompt. As most customers were already half way through their meals, the staff had plenty of time to give us their undivided attention. 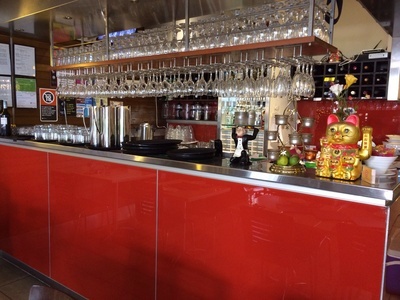 The atmosphere in the narrow clean restaurant was exotic yet casual. From where I was sitting, I could see the chefs at work. They were polite and friendly, treating me with a smile and a nod. 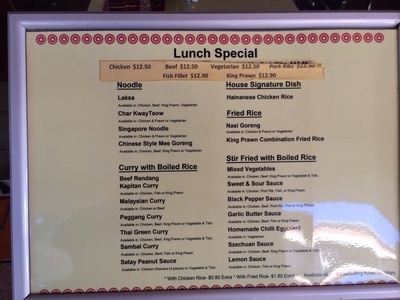 The menu was quite extensive, but what was the most attractive to us were the lunch specials. For only $12.90 I was able to chose a meat that came with a mountain of plain rice, tossed freshly cut vegetables, and three delicious accompaniments. 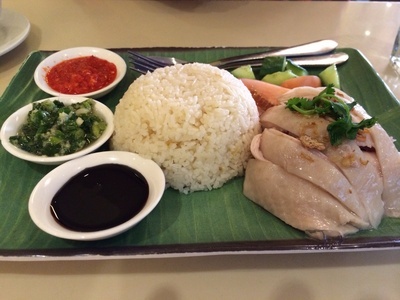 My meal, the Hainanese chicken rice ($12.90) came with a broth that I assumed was a soup, but scanning the neighbouring tables I concluded that the broth was there to moisten the dry white rice. The dish was quite simple but full of flavour. Melt in the mouth pieces of chicken with only a little amount of saltiness for taste sat beside a generous potion of rice. All the flavours of the meal came from the accompaniments, of which were placed on the side of the plate. A thick dark sauce in one shallow dish; a hot red chilli paste in another, and the icing on the cake comprised of that all too familiar green shallot, oil mixture. How much of what you use is entirely up to you. Once you add and mix everything together, the dish creates a sensational flavour. I was totally impressed, so much so that I ordered one of the same to take away. The second dish we ordered did not impress me as much as the first. The King prawn combination with the fried rice was quite an ordinary dish, which could have been found in any Chinese restaurant. My guest however, thoroughly enjoyed the dish; especially because the chefs had been pretty generous in serving the king prawns. 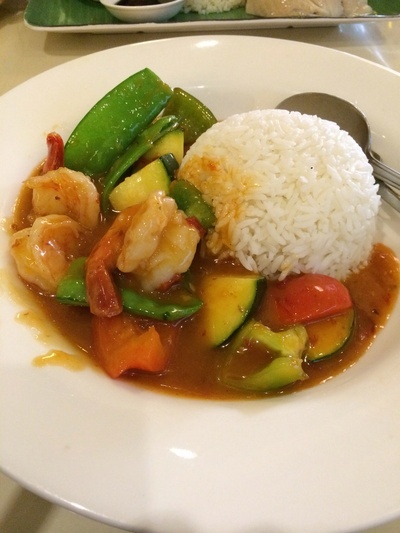 The thick sauce that was coated in the prawns and the vegetables was a tad too sweet for my taste; but my guest finished the dish without complaint, and was very satisfied with it. 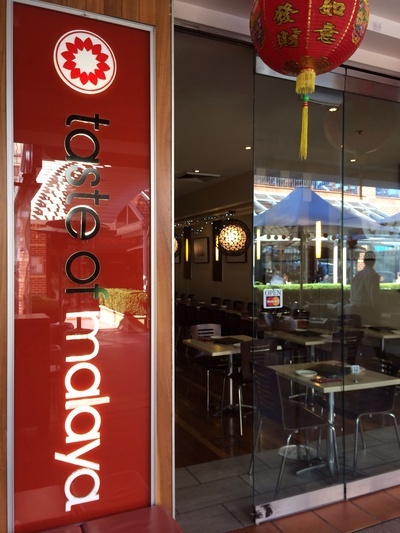 Taste of Malaya is not as busy as the neighbouring Chinese restaurant, but I believe some of the dishes served here are as tasty or even better in taste than many other similar restaurants I have been to. Where: Castle Street, Castle Hill NSW. Why: That second dish mentioned. Have you been to a masquerade ball? Do you close your bedroom door at night? Would you like to learn another language?